The game between the Cobras and the Dolphins leveled out on day three at Newlands, as the visitors took a 153-run lead. The game between the Cobras and the Dolphins leveled out on day three at Newlands. The day belonged to the visitors as Robbie Frylinck started the day with the task of preventing the hosts from pushing the lead out of reach. He took the last two wickets to finish with figures of 5-86 and made sure his side only had a deficit of 112 runs. 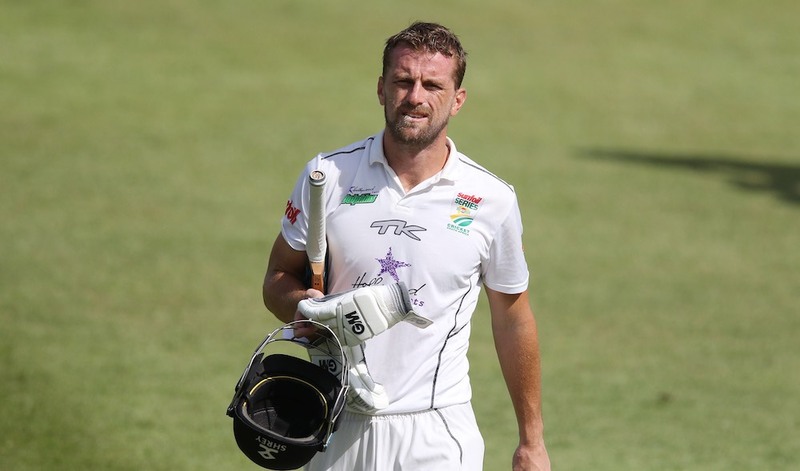 Vaughn van Jaarsveld was the free scorer at the start of the second innings, he managed 44 before Tladi Bokako toppled his middle stump with a peach of a delivery. Sarel Erwee contributed with 54 before losing his wicket, while Cody Chetty added 34 as the Dolphins began to take control. It was Dane Villas (69 not out) and Sibonelo Makhanya (53) who contributed with half-centuries of their own to take the Dolphins back into the game. Dane Paterson picked up three crucial wickets of Makhanya, Mungroo and Frylinck right before the end of play. The table-topping Cobras will be left with a small window to skittle the Dolphins’ middle order and take four wickets before attempting to blast down the target for victory. The Dolphins will hope to set a big enough lead quickly to declare early, so they can bowl out the Cobras for a much-needed win. Sinethemba Queshile fell one short of a maiden century for the Warriors as they posted a mammoth 457 in their first innings. Starting with an overnight score of 40, the youngster battled to 99 before losing his wicket to the Knights’ best bowler Duanne Olivier (4-119). With a lead of 178, the Warriors piled more pressure on the Knights. 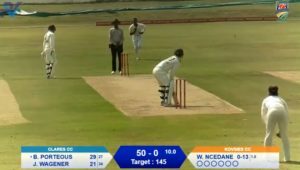 They took four wickets on the day and if it wasn’t for half-centuries from Pite Von Biljon and Luthando Mnyanda, the Knights would have found themselves in a tight spot heading into the final day. They still trail by 24. Dean Elgar’s 128, Jonathan Vandiar‘s 84 and 81 from Shaun von Berg helped the Titans post 419. Beuran Hendricks (3-77) and Bjorn Fortuin (2-60), were the Lions’ key wicket takers to bowl out the Titans before they reached their target. With a lead of 113, the Lions will look to score quick runs to take a sold lead and attempt to bowl out the Titans on the final day. The Titans, however, will need a lethal bowling performance on day four to still have a chance of victory.